Any set of blocks can be consolidated into a single grouped block. In addition to the ease of replication and enabling a "cleaner" canvas, grouping a set of blocks allows the user to virtualize or save the group to a library for future use. 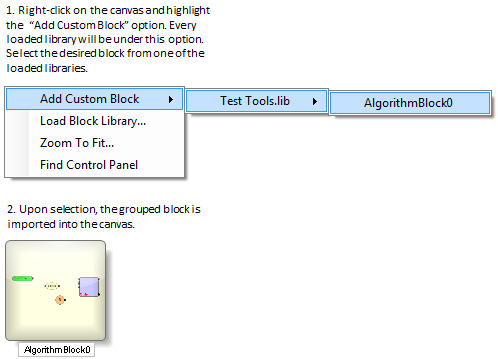 Double-clicking on a grouped block will load a canvas displaying the blocks contained within the grouped block. Use the located at the top portion of the main Designer to switch between the main canvas and the grouped block canvas. Ungroup: Ungroup the blocks contained within the group block. Virtualize Block: Virtualize the grouped block so that a new copy of the grouped block will be created every time a discrete event message enters the virutalized grouped block (see: Virtualization for more information). Add Connector: Just like any other block, a grouped block can have inputs which can be used by any of the blocks contained within the grouped block. In addition, any of the contained blocks can output its value outside the grouped block. 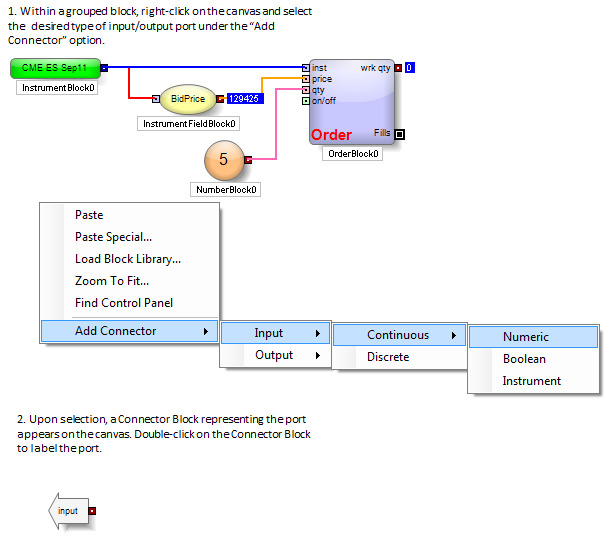 Selecting the "Add Connector" option allows the user to create a continuous (Numeric, True/False, or Instrument) or a discrete input/output port on a grouped block. 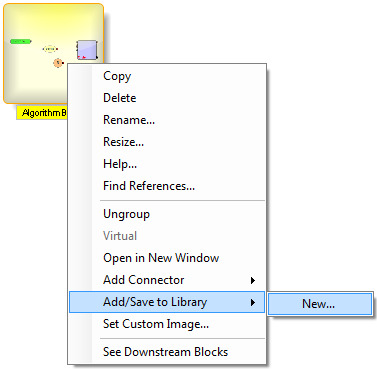 Add/Save to Library: This functionality allows the user to store and quickly reproduce a set of blocks. The user can save the grouped block to an existing library or create a new library. Set Custom Image: This feature allows the user to import a custom image that appears on the image of the grouped block instead of the typical thumbnail image of the contained blocks. Dynamic Connector: With this option enabled, each port on the Group Block will dynamically change its label to reflect the name of the block immediately connected to it. When a port becomes unconnected, it will revert to last label manually set by the user. View Connector Labels: With this option enabled, connector labels will be displayed on the surface of the Group Block (instead of the default thumbnail image). Select a group of blocks and right-click on one of the selected blocks. Then select the “Group Blocks” option from the menu that appears. Right-click on the grouped block, and navigate to the "Add Connector" option on the menu that appears. Then select the desired type of input/output port. To facilitate the ease of design, ADL also allows the user to create and label input/output ports within a grouped block without having to navigate outside the grouped block. 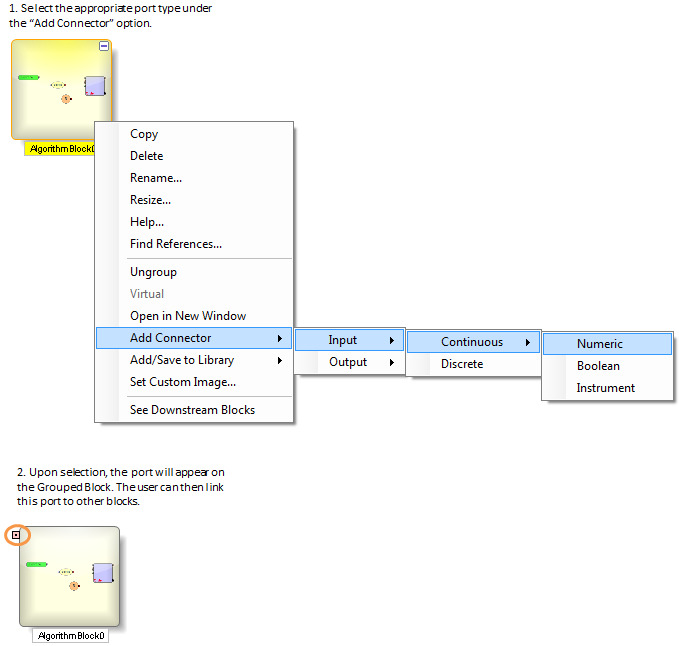 Note: You can opt to display the connector labels on the surface of the Group Block (instead of the default thumbnail image) by enabling the "View Connector Label" option located in the Block Properties Tab (lower-right panel of the Designer Canvas). Right-click on the grouped block and select "New" under "Add/Save to Library" option. 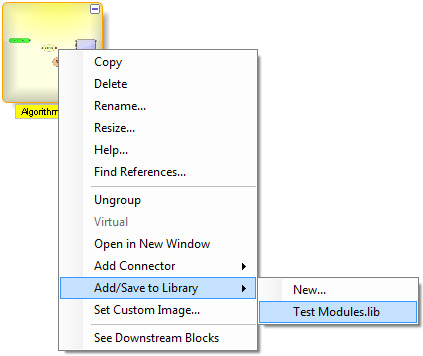 When prompted with a save window, name the new library which will be created to contain the grouped block. The user may also save or import grouped blocks from an existing library. In order to do so, the user must first load a library. 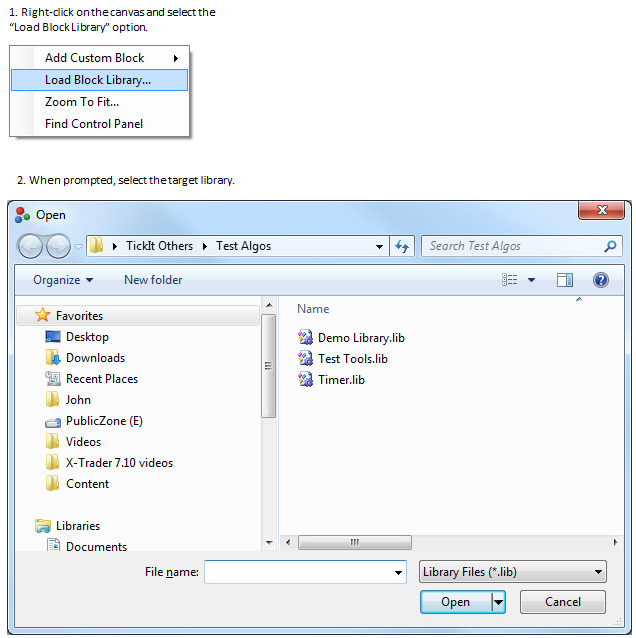 To load a library, right-click on the canvas and select the "Load Block Library" option. When prompted with a load window, select the desired library. Once a library is loaded, the user can quickly import any grouped block saved within the library. Conversely, once a library is loaded, the user can quickly save a grouped block to the library.